Despite years of research, the neurological basis for dreams is still not entirely certain, and several theories (including the activation synthesis theory, the long-term memory excitation theory, the continual-activation theory, and others) have been proposed for how and why dreams occur at all, none of which are entirely satisfactory or universally accepted. 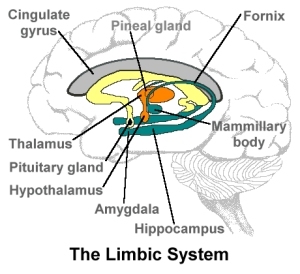 The activation-synthesis model, proposed by J. Allan Hobson and Robert McClarley back in the 1970s, suggests that, as circuits in the brain become activated during REM sleep, areas of the limbic system including the amygdala and hippocampus (the parts of the brain involved in emotions, sensations and memories) also becomes active. The brain synthesizes and subjectively interprets this internal activity, and attempts to find meaning in the random signals, the results of which are what we call dreams. Eugen Tarnow developed his long-term memory excitation theory in 2003, arguing that dreams are just the brain’s internal excitations of long-term memories. This theory holds that such excitations are going on all the time, even during our waking hours, but the “reality checking” of the brain’s executive function (which takes place in the prefrontal cortex, and which is known to be actively suppressed during sleep) usually excludes them from our notice. In some ways, this is consistent with many of Freud’s psychoanalytical ideas about dreams, with Freud’s unconscious replaced by our long-term memory. In 2004, Jie Zhang developed the continual-activation theory of dreams, which argues that dreams are part of the brain’s consolidation of working memories into long-term memories (declarative memories during non-REM sleep, and procedural memories during REM sleep). Zhang believes that both the conscious and non-conscious subsidiary systems of working memory need to be continually activated in order to maintain proper brain functioning and, when the level of activation of either subsidiary system falls below a given threshold, the brain automatically triggers the generation of a data stream from its memory stores. 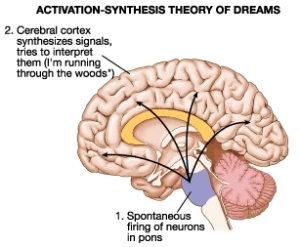 Dreaming is therefore merely an incidental result of the brain’s need for continual activation. But whatever the underlying reasons for why dreams arise, the physiological and neurological mechanisms underpinning the act of dreaming are, while still not entirely understood, gradually beginning to become clearer as modern research progresses. Recent studies have highlighted two specific areas of the brain in which the absence of activity seems to cause the loss of the subjective experience of dreaming: one, where the occipital, temporal and parietal lobes of the cerebral cortex meet; the other, in the frontal cortex, specifically in parts where dopamine is the dominant neurotransmitter. 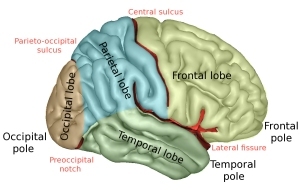 These areas, it should be noted, are completely unconnected to the areas of the brain involved in generating REM sleep, which is mainly regulated in the pons area of the brainstem. REM sleep and dreaming can, then, be completely dissociated from one another, as certain cases of brain damage and drug administration have proven, and it is becoming clear that REM sleep may be just one of the triggers for dreaming. Damage to the parietal lobe of the brain, for example after a stroke, can lead to a complete absence of dreams. Because the parietal lobe is responsible for bringing together all the different senses, it is hypothesized that the imaginary space in which our dreams take place is generated in that part of the brain. People who have damaged parietal lobes can usually fall asleep easily enough, but tend to wake regularly throughout the night, almost as though they wake whenever they would normally have experienced a dream. The neurotransmitter dopamine appears to be an important factor in dreaming, and people who take medications to reduce their dopamine levels tend to dream noticeably less, while those (such as Parkinson’s Disease sufferers) who take medications to increase their dopamine levels tend to dream more intensely, even though the frequency and duration of their REM sleep may be unchanged. During REM sleep, the limbic system of the brain, including the hippocampus and amygdala (which are involved in processing emotions and motivation, among other things) is very active, while some areas of the prefrontal cortex (which are involved in working memory and attention, but also logical reasoning and self-control) are notably inactive. This is consistent with some of the bizarre, illogical and disorganized imagery in dreams, as well as the absence of logic and self-criticism which often characterizes them. During dreams, then, the brain allows its most recently-evolved, more controlling side (the prefrontal cortex) to give way to a more primitive, less rational way of thinking (under the influence of the amygdala and the limbic system). Although the primary visual cortex is almost completely inactive during REM sleep (as might be expected when there are no external visual signals coming in), the extrastriate visual areas of the cortex (which are involved with analyzing complex visual scenes) are highly active, which is consistent with the elaborate internal visual images in dreams. Some researchers have even proposed the radical theory that we do not dream throughout REM sleep at all, because we do not have the consciousness necessary to generate dreams during this time. Instead, they argue that our dreams are actually constructed (from subliminal images generated while we are asleep) during the few hundredths of a second in which we are waking up. Dreams may also be generated in the same way during the several “micro-awakenings” we all experience throughout our sleep periods (even though we are rarely consciously aware of them), especially before, during and after periods of REM sleep. According to this theory, dreams represent the conscious expression, during awakening, of the unconscious brain activity that occurs while we are asleep.